Your Scottish heritage is one of the things that fascinates you the most. You love learning in-depth knowledge about where you come from and the culture behind the land. On the Kilt Articles page of Kilt Guide, you can learn all different kinds of information regarding your heritage--not just detailed information on kilts. You can enjoy articles that relate to Irish and Celtic music and other traditional, well-loved sounds that come out of Scotland. Peruse this page and find an article that interests you the most; you never know what interesting facts are waiting to be uncovered. Kilts are a rich part of Scottish heritage. They are perhaps the most iconic and memorable thing about Scotland for those who live outside of the country, as it is commonly thought that this garment originated in the country. Kilts have long been a cultural marker of Scottish people and their heritage. 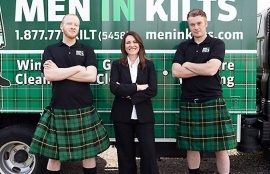 When you think of a kilt, you are likely to think about men in full Highland's Dress wearing thick, wooly tartan kilts and playing the bagpipes. The first things you notice are the smell of freshly fried cod and the fact that the men serving it up are wearing kilts. It’s only afterward that you notice the waiters are carrying not just trays of food – but pistols, too.